Copyblogger This is the third post in our series and will cover search engine optimization related to content. SEO is an ever-changing industry. One way to stay on top of the updated algorithms and the penalties that websites face is to stay abreast blogs and industry news (SEOmoz and Search Engine Land are great blogs to start off with). SEO goes further than just content. As mentioned in the last post (about quality content), penalties can be dished out to websites who load too slowly, have a high bounce rate, use Flash and many more reasons. But a sure way to avoid penalty is to remember the advice from last week’s post: Always keep the user in mind – whether your writing content or designing a website, the satisfaction of the user is the most important goal. Below are some tips, tricks and tools that you can use when incorporating an SEO strategy to your website content. ➢ Do your due-diligence – research core keywords. As I’ve mentioned in my previous posts, content is king. You should have content that is catered to the user. But how can you make sure that when a user types in a search query your company shows up as a result? Keyword research can help with that. Let me start with an example: If a user types in bark, search engines will likely generate two different versions of results. One area will cover dogs, while the other area will cover trees. What keyword research can help your business do is identify what users are typing into the search bar and target the best keywords to be used in your web content. These keywords will be known as core keywords. You will frame your content around these targeted keywords. However, don’t get crazy and keyword-stuff – the objective is to help the user identify and recognize that the page they’ve landed on holds the desired information. The Google AdWords tool, displayed below, will show you keywords related to the phrase typed into the search bar. It will also provide competition for the keyword (high means that the keyword is highly competitive and used often, by many sites) if there is a lot of competition for a keyword, it can be harder to rank for that term. 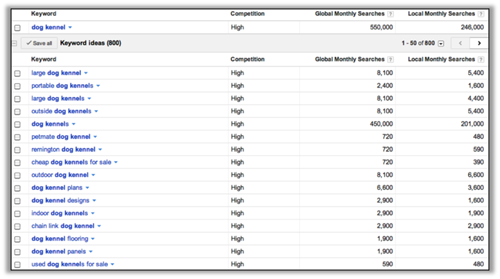 Global Monthly Search provides the number of times that term is searched in all locations, languages and devices. Local Monthly Search only pulls the number of times that term was searched according to specifications (I have Locations: United States, Language: English and Devices: Desktop and Laptops). ➢ Does bark mean tree or dog? Semantic keyword research can help you identify which term is the best to use when reaching out to customers. Like the example we used above, if a user types in bark, the SERPs will try to provide the best results. If the user truly wants results for a dog, and dog related terms, the easiest way your company can be apart of the SERP is to have core keywords such as dog; while incorporating stemming and supporting keywords, such as bark, kennel, etc. This will help the bots (mentioned in the previous post) understand what content your page provides and will populate your page for the user. The screen shot shows what Google AdWords generates when I typed in the word bark. The competition for the word is low, even though the search for the word is extremely high. This is because bark can mean so many different things, depending on the user. 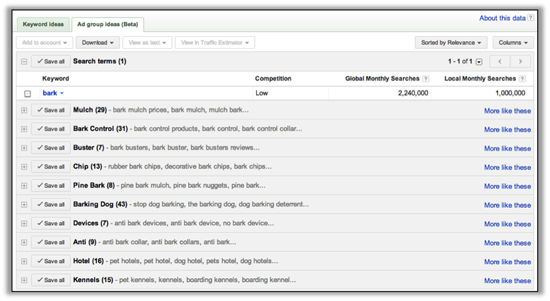 If you look to the far left, AdWords gives me the opportunity to see more terms similar to the keyword by clicking on “more like these.” Clicking on “Kennels” (at the bottom) will give the user keywords relating to their original desire – dogs. This is just an example of how important it is for your business to identify what words they want to use as their core keywords. Once you have figured out that your company wants to target kennels, not just bark, you can create a list of stemming and supporting keywords to help make your content robust. So I’m going to provide a list of example core keywords, semantic keywords and stemming keywords. Of course this is just an example of how you can create a list of terms that relate to your core keyword. One tip is to lay the list out as a map connecting words together, so you can visually see which keywords are secondary (stemming or supporting) and which are the core keywords. ➢ How do you know if your keyword will help you rank on the SERPS? The truthful answer is that you can never really know, however you can use tools to help you get a good idea. SEOMoz’s keyword difficulty tool is great at helping you understand how often keywords are used on websites, and how competitive those sites are in the SERPs. However, their tool isn’t free, so unless you have a subscription try Search Bliss’s Keyword Ranking Difficulty Check. This web shot captures how dog kennel ranks compared to other websites. 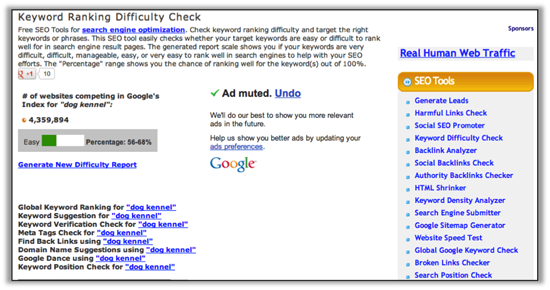 The report presents how easy, or difficult, it will be to have your website rank for the keyword/phrase dog kennel. It appears that a website would have a 56-68% chance of ranking for the term dog kennel. When conducting your search for appropriate keywords, Google AdWords and difficulty tools can be helpful. Not only will those free tools help you think of keywords and decide if you want to try ranking for them in the SERPs, but they’ll help you understand what chance you have compared to the competition. However, the most important tool is your strategy. Be sure to thoroughly research keywords. Build out your list of core, stemming and supporting keywords. More than anything, your content will speak to the user, so make sure you’re saying the right thing. In the next post I will discuss how to use keywords to build out landing pages. The architecture of a website is important, and knowing how to add pages can be helpful when creating a site map. Stay tuned for the next post, running on December 4, 2012. What other SEO tools do you use for content? 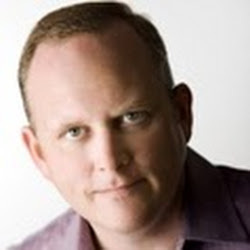 Sean Jackson is the CFO of CopyBlogger, a content marketing solutions provider. His expertise lies in content marketing strategies and website solutions to help businesses increase traffic and brand awareness.